Lovie for Good is a collaborative program formed by The Lovie Awards and WP Engine to showcase Lovie-recognized projects built to change Europe. Describe your Lovie-nominated project. What’s the elevator pitch? "To show what less diversity looks like, EDEKA opened a supermarket without foreign products." Why this particular cause as the subject of your project/campaign? Was there a moment that inspired it? "In 2017 there was a YES to Brexit, Trump wanted to built a wall between the USA and Mexico and the right wing party AfD had good chances to become part of the German parliament. It seems like even if it’s the diversity of different nations that shapes our world, people are more and more scared by that diversity. So in the election year 2017 German supermarket EDEKA decided to make a powerful statement pro diversity." What real-world impact were you hoping to make with this project? Did the real-world impact meet your expectations? 'We hoped that this idea—just a week before the federal election in Germany—would make people think about the situation in Europe and open their eyes that diversity is important for every one of us. Instead we got an even better result: a worldwide discussion about diversity and xenophobia." Did your team have a specific “breakthrough” or “a-ha” moment while formulating or executing this project? "The most rewarding aspect was the enormous response to the stunt. From the majority of customers coming to the supermarket during the stunt, telling us how much they appreciate living in an open-minded and diverse country to the worldwide discussion about diversity that the stunt became an important part of." Was the tech/medium you chose essential to conveying your message? If so, why? "Yes, it was: Xenophobia and the fear of foreign cultures already are a part of our everyday life. So instead of starting a classic campaign against xenophobia, EDEKA decided to also bring their statement of pro-diversity into the everyday life of their customers. Customers didn’t just become a part of the stunt, thanks to their filmed and shared videos they became the ones to turn the stunt into the starting point of a still on-going worldwide discussion on social media." What was the greatest challenge that arose during your work on this? What about the most rewarding moment? "The biggest issue was how to empty the supermarket shelves with only one day for preparation and how and where to store the banned products during the stunt without doing them any harm. In the end, the team emptied the shelves within one day and stored the products in trucks at nearby parking areas, parking decks and in EDEKA warehouses. 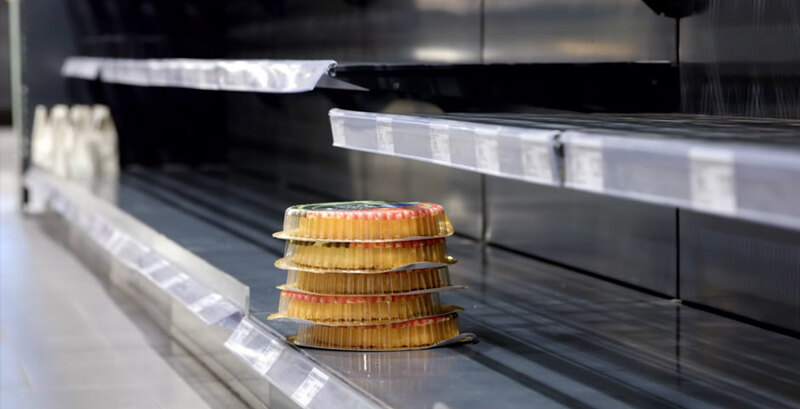 Several refrigerated trucks ensured that frozen food was stored perfectly fine and everything could be put back onto the shelves after the stunt was finished without a single product going bad." What did you learn in the process of creating this work that you didn't know/expect going in? "In preparation for the stunt, more than 20.800 foreign products and products with ingredients from other countries were banned from the supermarket shelves. Even though the stunt was made to show customers in Germany and the rest of the world how many products from all over the world each of us consumes on a daily base, we were surprised ourselves by the amount of international products we consume, from chocolate to cheese." We hoped that this idea—just a week before the federal election in Germany—would make people think about the situation in Europe and open their eyes that diversity is important for every one of us. Branded video content that promotes corporate social responsibility or serves to further a particular societal cause or issue.